We hear sometimes: “Whatever love means”. What if we knew what, truly, love means? What if we had a model that allowed us discernment and understanding of the different types of love? No need to look further. 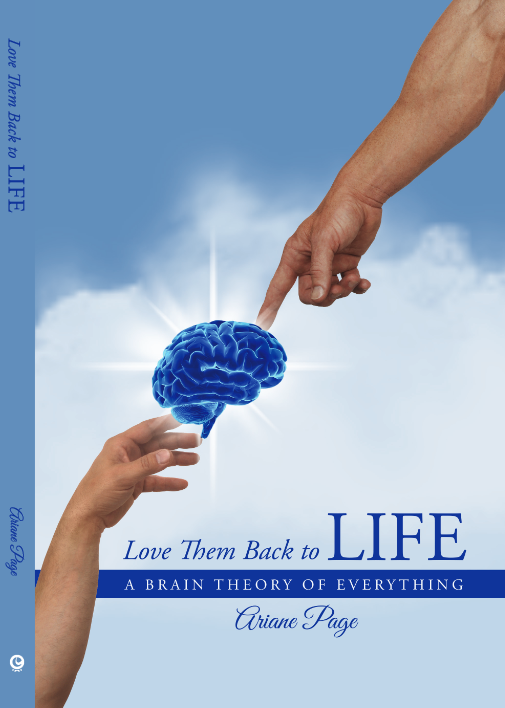 This new title: Love Them Back to LIFE: a Brain Theory of Everything by Ariane Page suggests to embark on a journey of self-discovery thanks to this model. No need for meditation or practice of a new extreme sport to achieve this. As the previous book Isis Code explained, everyone, even Nature is built on this model. With the rise of modern science we lost track of the very necessary universal point of view the model supposes . The discovery in brain research that the true executive brain is in fact subconscious re-opens the door to this holistic world in which love, the tool used by this model, is center stage. It is love that coaxed us on the path of evolution towards the collective, optimal human. That “love is the most powerful of all powers” , king Salomon had already experienced it millennia ago when he, the-wisest-man-who-ever-lived, was vanquished by love. What we have to realize now is that although biological love is close to an instinct, humans’ psyche is physical, emotional, mental and symbolic. The “love” humanity can express is therefore multifaceted in the same way. I say “It is by learning to love that we are loved” because with the rediscovery of this model comes the realization that only by knowing ourselves will we meet our goal of finding a true, profound happiness during our lifetimes. Reading Love Them Back to LIFE is one step in the right direction.